Mandy and Malcolm of Staplehurst wanted bespoke cabinets made for their sitting room. These would house the TV and related hardware, DVDs and a display cabinet for their china. The units were made as separate items so the configuration could be changed if they wish .They were constructed in European oak, 6 and 19mm oak veneered board with the glazed doors in a smoked grey. The doors and drawers have half astragal mouldings with the top and base mouldings being a particular challenge going into the 45* corner unit. 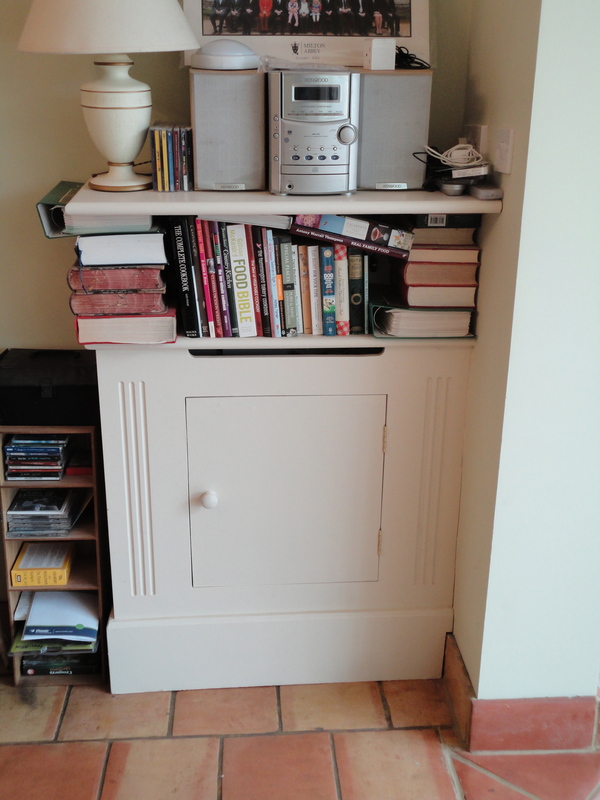 The shelves are adjustable below the Tv with plenty of access for wiring, in and behind the cupboard. We had trouble locating suitable drawer knobs the style and dimensions weren’t quite right so I had a local turner help out. The clients collected the pieces and I was told it fitted perfectly! I was approached by Clare Langdon at Clare Langdon Interiors in Cranbrook with an idea to make a series of bookcases to house her collection of material pattern books. This former blacksmiths forge had the advantage of having firstly a reasonably flat solid floor and secondly a long recently installed plaster board wall. The other requirement was to provide some kind of division between the front area with the window display, seating area and the display section behind. With the design worked out and approved by Clare work began on the ‘L’ shaped shelving unit. The plinth was constructed from 6″ x 2″ European redwood to take the weight and was pre-scribed to the floor before finishing. The furniture was constructed in 18mm board which was lipped on the edges ready for machining the mouldings. Tulipwood ( American poplar) was used for the edges and mouldings. 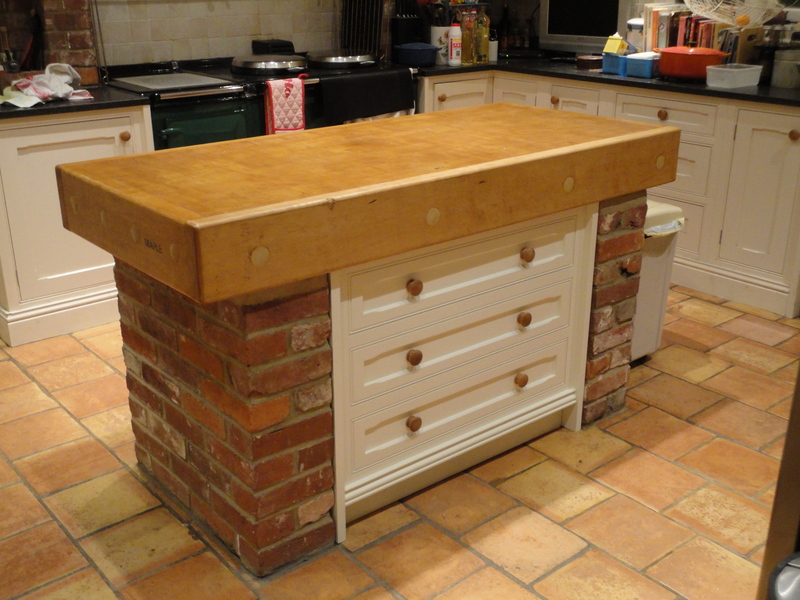 The units were made in sections and finished in the workshop and then assembled on site. The stunning colour chosen by Clare is F&B Down Pipe mixed up specially for the spray paint finish. Once painted the various sections were delivered, the first day went particularly well with the base sections and right hand sides in place. This allowed me to measure up the false wall in order to prepare the stud work and get the plaster board precut to size and by this time Clare was getting quite excited. The next day was preparation in the workshop for the end wall and then back on site more assembly with pieces being scribed to the wall (even flat walls need the furniture to be trimmed to fit on occasions). The third day had all the units and trims fitted and screwed into place. The second plaster board was fitted and the hand made skirting board to match existing was glued into place awaiting the decorators to fill holes and work their magic. The final pieces of the jigsaw were the two top mouldings. I must say I was very well looked after by Clare and her team of ladies with frothy coffee and cakes together with the odd lift with the pieces. The two corner shelves were just a little too snug so they were trimmed and refinished and returned a couple of days later. I look forward to posting a couple more pictures with the area beautifully decorated by Clare. New clients from Wadhurst required a fitted bookcase / cupboard unit and a TV cabinet that could be moveable for their newly converted room. The furniture was finished in F&B All White colour. The TV cabinet with 2 storage cupboards, DVD drawer and hardware shelves above. Again the wiring required ” hiding ” especially as the unit can be pulled away from the wall, the solution was to have a compartment in the base ( see the pictures ). Whatever to need to store in your TV cabinet we can make it work. This study was created for a client in Hawkhurst, Kent to house the usual paperwork box files and printers associated with running a business. The colours chosen by her compliment the room beautifully. The left hand unit houses a printer behind a lift up flap, with file storage below. 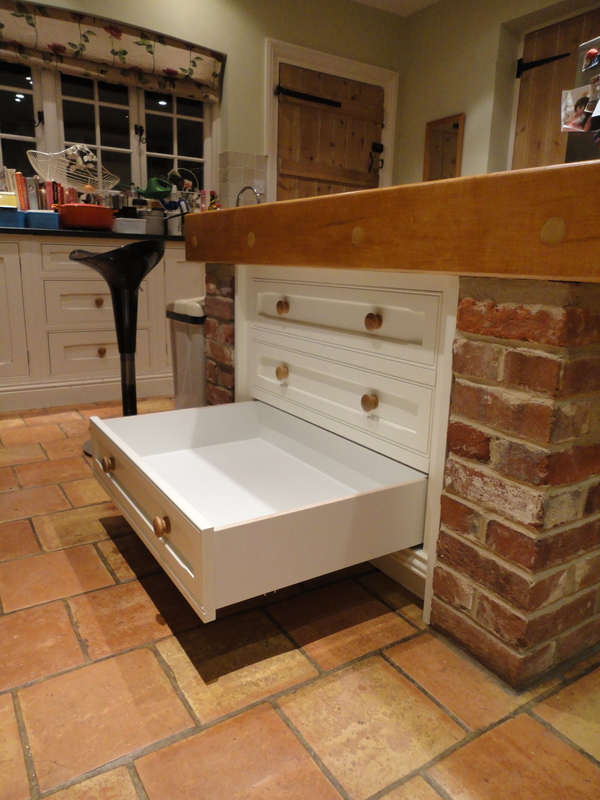 The right hand drawer cabinet sits forward of the radiator and is fully fitted to the wall behind. The desk top in oak veneered board and oak edging in a light oak finish has a vent for the radiator and cable tidy to access the wiring below. The bookcase has shelves suitable for box files. Please see our profile page on Which? Trusted Traders and our customer reviews. A young couple in St Leonards on Sea came to us with a design for a TV unit in Walnut to accommodate various hardware, incorporating drawers, doors and flaps to be hand painted adding texture and brightness to the piece. The eclectic knobs were sourced by Steph. Wiring is always an issue when so many bits of kit need connecting together but are all hidden below the unit behind the rear support. New clients from Seaford wanted a large freestanding bookcase / wall unit incorporating cupboards. After discussions on what was required and after a second draft details from the “Arts and Crafts” period were the primary design features. The piece was completed in the workshop and spray painted in the chosen colour prior to installation . On delivery the base section was positioned and assembled. The top section was a different kettle of fish though, requiring fixture to the mid shelf on a set of trestles before being heaved onto the base. Top moulding was put in place and the unit was tagged to the wall (just stops any movement on the carpet). Great pleasure to do this job! Today I went back to Seaford in East Sussex to visit John and the bookcase I made and installed a couple of years ago. The bookcase was made in veneered and European oak in a natural oak lacquered finish, with fully adjustable shelves and scribed to the walls giving a good close fit. 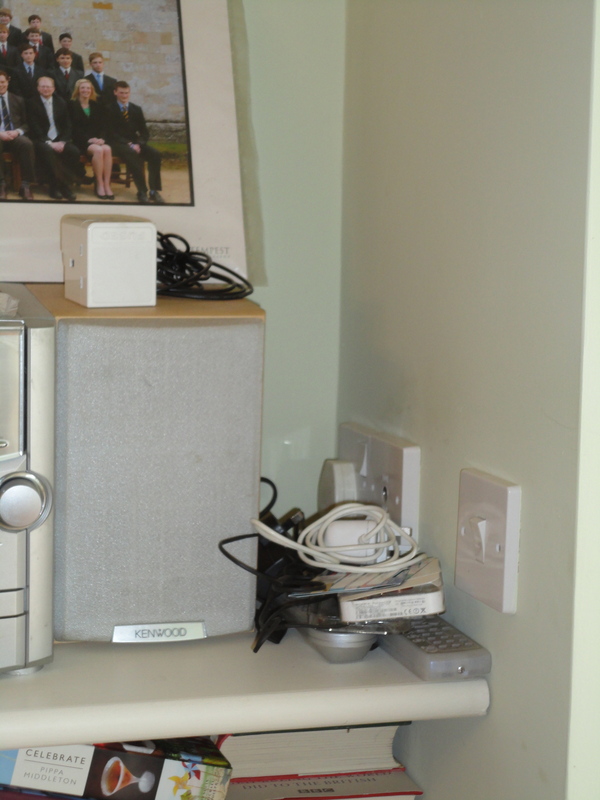 My clients in Sedlescombe also wanted to improve the cupboard setup in the breakfast room with shelving above, including space for the hifi. 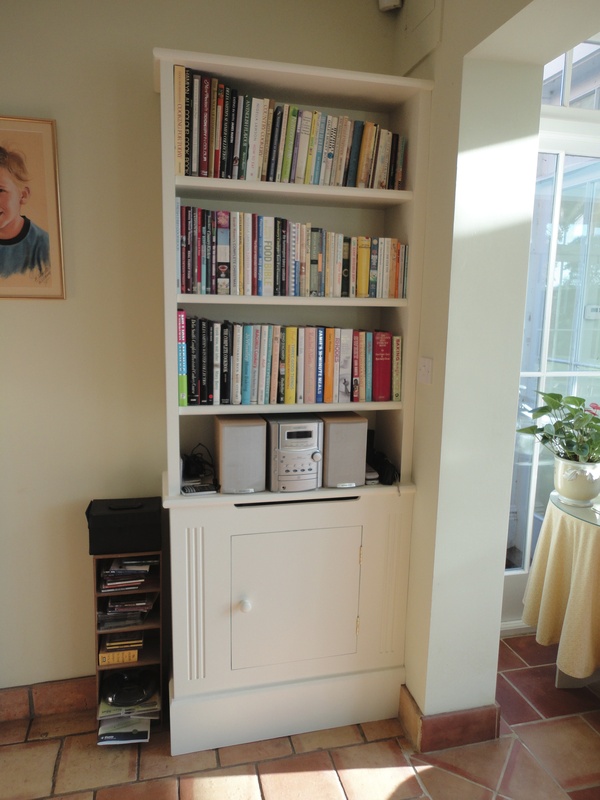 The cupboard was removed and modified with a new top and bookcase with fully adjustable shelves, suitable access for the plug sockets and a clean fitted finish on all the wall meeting points. The piece as a whole was spray painted to an suitable colour. If you require an alteration to an existing piece of furniture please do give us a call to arrange a quote on 01580 830667.